Peter Bergen at CNN interviewed William H. McRaven (seen in the above U.S. Navy photo in uniform), the retired Navy SEAL admiral who planned and executed the raid that killed the most wanted man in the world, Osama bin Laden. ( CNN) The man who was the architect of the raid that killed Osama bin Laden in the suburbs of a Pakistani city was getting anxious. 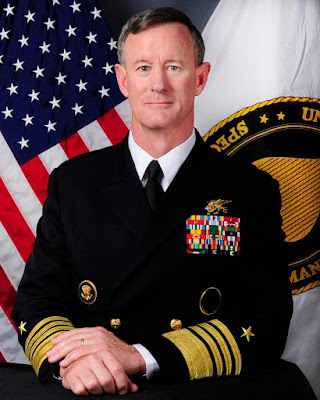 He had thought it was possible to keep an element of surprise and evade any response from Pakistan's military if the U.S. Navy SEALs could complete the mission in 30 minutes, Adm. William "Bill" McRaven told CNN last week in his first in-depth interview about the operation. But after killing bin Laden and his bodyguards, some SEALs went down to the second floor of bin Laden's house and found a treasure trove of hard drives and documents. Now they were trying to pick up all this, which was stretching the time on target. After about 40 minutes, McRaven was "getting a little bit anxious," he recalled. Speaking to the ground commander, he said, "Hey, get everything you can. But it's time to wrap this up and get out of Abbottabad." As they lifted off from the Abbottabad compound, the SEALs had spent 48 minutes on the ground.